So I've been fairly busy with a lot of things lately, and while I tried (and will continue) to keep work-related things off the blog, I thought I'd check in and note that I recently finished my job in one local Japan-related field and moved to another. I'm sad to have left my office and the great people there, but my contract was ending, and an opportunity came up that I couldn't refuse. So what this does mean for me...? 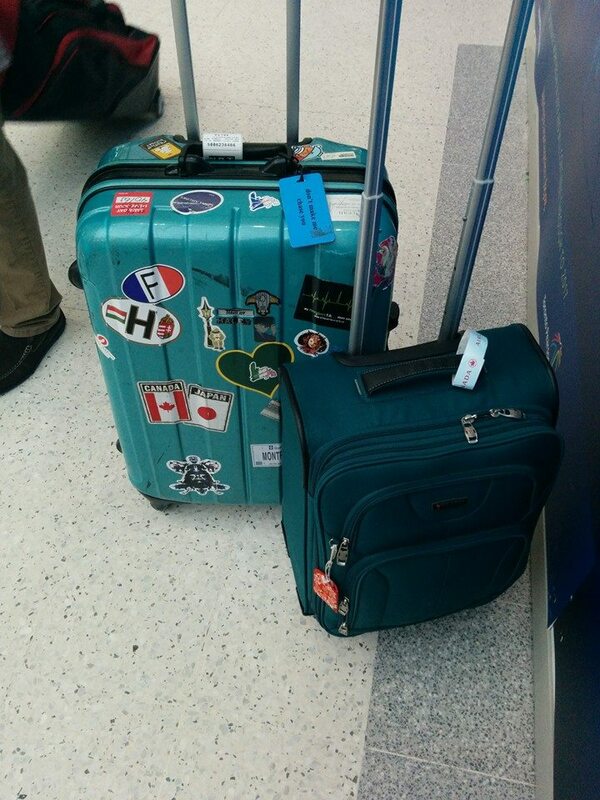 As it turns out, it means a lot of travel to Japan. I'm so excited to have already been back to Tokyo (and eventually I want to take a vacation to my true second home Osaka, of course) and the first visit was really and truly surreal. Maybe it sounds really silly, but I think anyone who has had their heart in two countries at once can relate. It's not about Japan itself but the feeling of being immersed again in a place that was once "home" that I missed very much. I took the train from Narita out to Azabu-Juuban, and on the long ride, it was hard to do anything but wax nostalgic! It was early, but even on a Saturday at 8 AM, students in uniforms were taking up most of the train car. On their way to their club practices, I'd imagine. One high school-aged boy sat beside me and I immediately recognized his cologne or body spray as a familiar scent from my own classroom at 〇〇 High School. I'd never been on that train line before or seen that scenery, but just being there on that train, sitting with the Saturday shoppers and the schoolkids and breathing the air and seeing the signs fly past the window, I was feeling so natsukashii. I wasn't meeting my friend until 9:30, so I strolled through Azabu-Juuban for a time, a little wowed from how it had changed since I last visited, with Ami-chan years before. Ichinohashi Park was completely gone, and a construction site was in its place. Azabu-Juuban's main station entrace, outside the Shotengai, had also been spruced up a bit. Funny, but I never visited Azabu again after taking Ami-chan there, even when I had lots of time to kill in Tokyo in the past. I guess I felt that as a pop-culture location, most of the places I would have liked to see had already been gone for years by the time I moved to Japan. It was really nice walking through there though, and after a stunning only-in-Japan Cantaloupe Melon and Cream Frappuccino at Starbucks and a melon pan run, I eventually ended up in Roppongi Hills to meet my friend. We saw the Sailor Moon exhibition and had lunch at CoCo Ichiban, which I really still don't have the recipe nailed down for yet. Then we were out of time, and I had to head to work. I was trying to pretend that this was a normal Tokyo trip like the many ones I'd taken before, but as on the visit to Japan a year ago, I couldn't shake the sense of "limited-time" urgency. I probably never will be able to manage that totally, given that when you're on a company trip, the clock is ticking. On the bright side, the next trip is already in the calendar. As with any "log" sort of entry, I'm mostly keeping this story of my trip for my own records - but I hope you readers enjoy what is a bit of a more personal and detailed account than the posts on this blog usually are. After I've written all of this down, I'll go back to the more conventional topics! My former JTE had arranged with 〇〇 High School for us to drop by around lunchtime - it was exam week, so lunch was really the only viable time. They also warned me that the other teachers "might" be too busy to be around. This was a bit disappointing (and I was afraid that it was a gentle tactic to dissuade me from coming on such a busy day) but I was supposed to be prepared to leave for Hokkaido the following morning - a Saturday - so this was my only option. In the morning I borrowed a bicycle from Mari-sensei's husband and took it on a long ride, up to where I used to do aikido until it became far too cold to bike 40 minutes in winter. (Even an Osakan winter.) There was a hobby shop up there that I was looking forward to visiting. I would stop there after aikido, even though that was after 8 PM, and find the most wonderful little collector's items. I was a bit hazy on the details of where the place was (it had been 8 years, and it wasn't winter, or dark) so I pedalled around a bit trying to find the sports complex so that I could pretend that I was leaving the dojo to go home. I did eventually get there - unfortunately, when I arrived, I found that the shop was permanently closed. I looked out at the familiar sign in the parking lot and felt that sort of nostalgic regret of an experience you didn't even know you needed to have again, just vanishing. I biked back toward the school, and even found another (lesser) hobby shop on the way, but there was something lost by not being able to go to my place. It was my first experience in 〇〇 City of the familiarities of "home" disappearing. I'm sure there will be many more, the further in years I am removed from my tenure in Japan. I parked in the Staff parking - looking around for my own mama-chari, which I'd left in the staff parking five years prior before handing the keys to a co-worker to keep - and wandered in. Again there was that "stranger in my own house" feeling as I walked past students who looked at me with curiosity. I wore a pair of guest slippers and marvelled at how the genkan had been updated; the shoe boxes moved. Upstairs, though, things were much the same as ever. The English department hadn't changed an ounce. Even my own old landline phone number, written by a previous JET and now long disconnected, was still scrawled on the chalkboard. My desk was occupied by a new ALT, but the trimmings were the same. Same yellow LAN cable, map, cork board and pencil drawer. Same magnets on the metal box. We sat in the chairs we'd always sat and I talked with O-sensei, my former deskmate; and K-sensei, who'd been at the school the longest and I was sure would have been transferred away by then. I was so relieved to see her! T-sensei was eating lunch upstairs in the library, warming up by the gas stove, so we went up to visit. I didn't spend much time in the library, but I recognized the books there. An English copy of Alex Haley's "Roots" always caught my eye in its regular spot by the door. Somewhere, there was a very rare Kodansha English edition of the first printing of Rose of Versailles, published 1983, that I had taken home from the glass cabinet once to read, shortly before meeting Frederik Schodt in Shibuya for his Astro Boy Essays book launch. It was one of my very first trips to Tokyo. Y-sensei was in the department heads' office, where he confided to me that he would be retiring from the school the following month. I had been very lucky to visit at the time I did, else he and probably K-sensei would most likely be gone. Tension was a bit high, I thought, as everyone waited to see who would be transferred after exams. I remembered when my other JTE had been transferred away from 〇〇 High School during my final year, and how devastated she was. 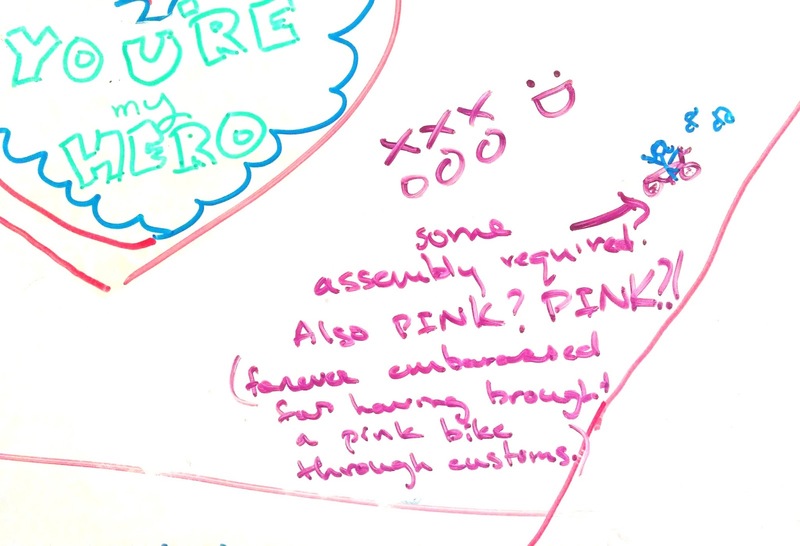 Mari-sensei reminded me of that during the visit - how we used to call her Pink-chan because, like me, she loved the colour pink. She always wore her hair in the same way, in little clips. It was really cute. <3 I wish I could have seen her during this visit. Once we had chatted and exchanged omiyage and taken photos, I felt obliged to head out - it was a busy week for them, after all. I said farewell to Mari-sensei and rode the bicycle back to 〇〇-〇〇 Station to catch a train. It was time for my second appointment of the day, a visit to the Japan Foundation Kansai Institute, where I'd done a short language study at the beginning of my time on JET. I really wanted to re-visit this place - it made quite an impression on me during my earliest days in Osaka. I never blogged about that particular experience, which makes it harder to recall, but it's one of the early defining moments. We stayed in the dorms at the Institute and attended Japanese lessons during the daytime, and explored Rinku Town by night. There was a little JET gathering on the beach and I swam in Osaka Bay, fully clothed, on a particularly warm night. (Probably not the best idea.) I remember the view of the bridge and the airport from the cafeteria, the lunch trays of tonkatsu, and browsing the library, inspecting Detective Conan VHS tapes and spending the half-hour breaks between classes watching the original Pocket Monsters on TV in my dorm room. I bought a satellite dish at Yodobashi Camera as soon as I returned from the Kansai Institute, so that I could get the same TV channels I'd seen there. Anyway, neither the Institute nor Rinku Town had changed much, so I spent a lovely afternoon there meeting the librarians and browsing their collection, and then I went to the shops to browse before returning to 〇〇 City. I fell in love with some bikes at Asahi Cycle. (More on this in my fanatical post about Dutch bikes.) I ate at CoCo Ichiban, one of my favourite lunch spots. I hemmed over a dilemma on how I was supposed to pay for the teacups I bought on Yahoo! auctions now that they don't accept overseas credit cards, and tried to get a vanilla visa to help with that, but the clerk didn't think it would work, so I gave up and had to ask Nicole (of Irish Chocolate fame) to pay for it for me. Eventually, I got on the train and went home to have another bath and pack up for an early morning. I drank tea with Mari-sensei and we ate bakery treats (she's so thoughtful!) as she told me about her volunteer singing work at the local old folks' home. Then I went upstairs to pack my things - Mari-sensei had offered to let me leave my big suitcase behind while we were in Tohoku and Hokkaido. 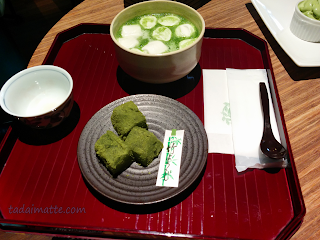 The following morning I set out early for Kyoto to visit Tenzan-no-Yu while I was still a solo traveller. Cass is not a big onsen fan and we had enough of them planned that I wanted to get at least this one out of the way when I was alone. Unfortunately I definitely felt the strain of no time, and no mobile Internet (the charge hadn't taken on the pocket wifi) and it wasn't as relaxing a soak as I'd hoped. I didn't even buy anything from Bambocheur! Yet I still managed to leave late and miss the bus and therefore miss the shinkansen I wanted and have to text Mitsu from the train to ask him to pick up Cassie from the airport. Even worse, I'd told Cass to meet me at the Haneda Starbucks - I wanted to buy the Haneda tumbler - and Mitsu informed me that the Starbucks was in the domestic terminal, not the international one!! So I spent the ride from Kyoto to Tokyo to Hamamatsu very stressed, but luckily Mitsu found her, and I found the two of them thanks to mobile Skype. Most of the day was lost to travelling (Tenzan is not exactly close to 〇〇 City) and we then had to pick up Cassie's Rail Pass, at Tokyo Station since the Haneda office was closed by the time she arrived. We barely managed to have the energy to eat fluffy omurice before heading to our hostel in Asakusa. Mitsu was really disappointed that we only spent a little bit of time with him, but it couldn't be helped. Cassie was tired, and therefore murderous; and we needed to be in Tohoku the following day! When I once again set foot on Canadian soil in August of 2010, basically the very first thing I did was purchase a bicycle. Having a new bike right away, I hoped, would take away the sting of leaving behind my mama-chari in Osaka, at the very last minute, as I hastily dropped the keys with a Post-It note on my co-worker's desk on the final day. Basically, I needed the bike right up until that day, and I didn't have time to deal with boxing it up for transport across the Pacific. I thought that at least if I left it at school, it would be used by someone, and perhaps someday I would see it again. I took the second key home with me, just in case. The first week back home, I bought a cheap Wal-Mart bicycle. 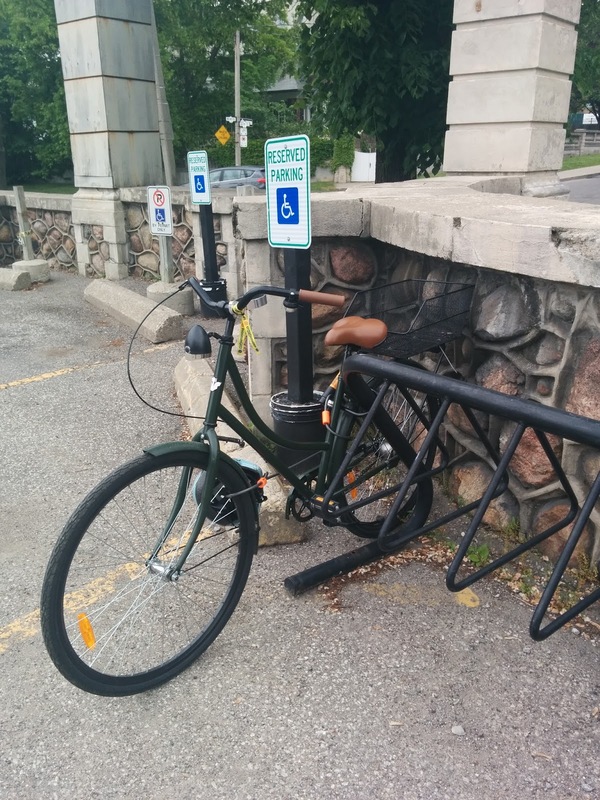 I needed to get to work, and I'd become accustomed to the independence of travelling by bike. I also bought a helmet, because unlike in Japan, I was significantly more concerned about being hit by a car. It was a Raleigh five-speed cruiser, and not an expensive one; it did have a partial chain guard, which was the main thing I was missing about my mama-chari at the time, as I remembered ripping up a few pairs of jeans on my mountain bike as a youth. It also had the curved handlebars I liked in cruisers. I have to assume the Japanese adapted their bicycles from European ones, as they were trading with the Netherlands as early as the 1600s; and Japanese bikes bear strong similarities to Dutch ones, from the covered chain guard to the skirt guard, both of which are very uncommon in North America. Fender mudflaps and rear racks occasionally show up on American-made bikes, but are standard in Japan, along with the rear wheel lock and ubiquitous front basket. I would have liked to have had a bike with all the trimmings, but I had to settle for what Wal-Mart had in their inventory at the time. In retrospect, I was actually lucky to get a bike that had two out of the six features I wanted. I installed the rear rack and basket myself. Eventually, as all Wal-Mart bikes are wont to do, it began losing steam in its 4th year, and during a particularly rough trip into the Nordheimer Ravine one autumn, my jacket fell out of my rear basket and twirled itself around the derailleur, which fortunately did not end in my dying in the ravine. The bike was never particularly great at switching gears again. But we're going off on a tangent. 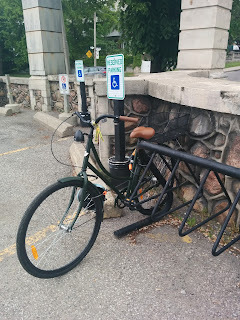 As I searched for a replacement to my bike (I had moved to Toronto by then - taking the bike with me, wrapped in a tarp - so I had many more options) I decided that it had to be Dutch or nothing. I wanted a skirt guard; I wanted a proper rear rack. I walked down Bloor Street taking photos of bikes I liked and jotting down their make and model to Google later. I never walked by a bike without giving it a once-over. To my surprise, though, the premium to get such luxuries as full chain guards required paying CAD $600+ for the bike. As I looked at bike shop after bike shop, almost buying a Giant-brand Liv Simple, I realized that I would never be able to tick all the boxes affordably. I finally settled for a step-through Beater Bike, with a partial chain, and a rear rack at least. What I hadn't bargained on was how much less hill-friendly the Beater was going to be compared to my Raleigh, with its fat tires and five speeds. The Beater, gorgeous though it was, was useless on hills, and the tires were the perfect size for getting caught in streetcar tracks. Riding it was exhausting. So I went back to the drawing board, formulating a plan for my trip to Japan in February to just buy a cheap mama-chari, have them box it up right in the shop, walk it to the post office and pay to have it sent home. I figured I'd be out $150 for the bike, $50 for domestic, $100 for the international shipping. Maybe a bit from customs on the other side. That sounded a lot better than the $600-ish I was pricing for Dutch-style bikes with gears in Toronto. I think you guys already know this is going to go downhill. I left it until the last minute. 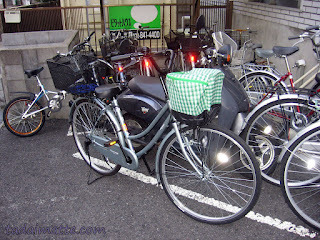 I looked at bikes at Asahi Cycle in Rinku Town and Tokyo, but I never spotted one close to a post office. Eventually, when I was on my own in Tokyo with just 1 day left in the trip, I realized this wasn't going to work. 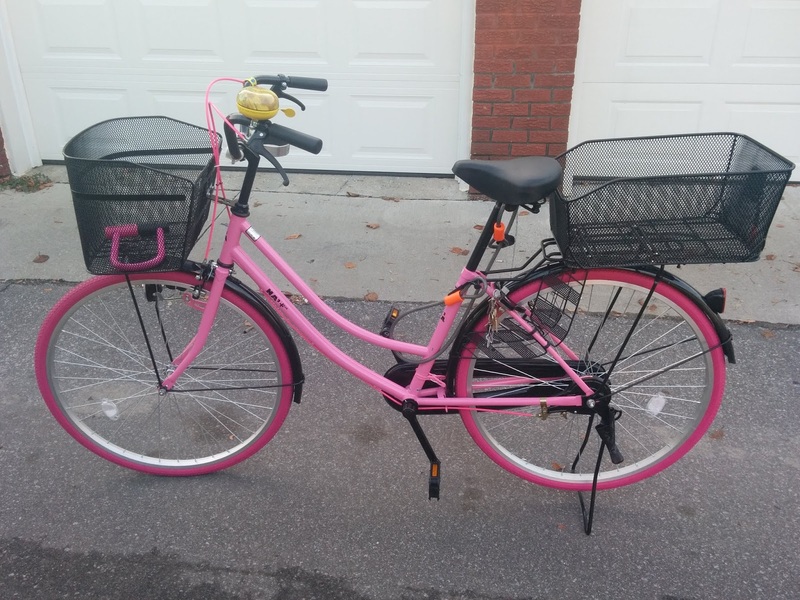 I got home, went on Rakuten and found a seller that did international shipping for Daiwa bikes, and I bought a cute pink Nana+ bike. No need to drag anything to the post office myself! They shipped to Canada! ...except that they only shipped to Canada through their proxy service. I had used Tenso before, but not in a few years, and the hoops they had me jump through just to get the bike shipped anywhere were out of this world. I waited two weeks without seeing my item appear on the "my page" section, even though the domestic shipping said it'd been delivered. I emailed them, and had no response for days. I emailed again, and still nothing! What!? I started to worry that maybe this company was less reputable than I originally thought. I sent a third help request, which got a response at last, and was informed that since it was oversized, they hadn't yet connected it to my account, oh, and also it was too oversized to be shipped abroad. It had arrived fully assembled. I learned later that this is the standard for bike shops. Tenso said they were unable to downsize it for me by removing the pedals/turning the handlebars as they were not trained to do so. From there we began the lengthy process of finding a solution where I wasn't out $200+. They offered to ship it elsewhere in Japan for me, but in order to do that, I had to verify my address in Canada. Mind you, I'd already done that when I bought things through Tenso in the past, but it had to be done again, including scans of my driver's license and the receipt of a postcard at my mailing address. Only when they were satisfied that I really lived at my address in Toronto would they allow me to redirect the bike to a friend in Tokyo. I don't have tons of friends in Japan whom I'd be comfortable asking for a favour so large as "can you receive this bike in the mail, take it to a bike shop to take it apart, and put it back in the mail?" and even fewer that I wouldn't mind being laughed at by. 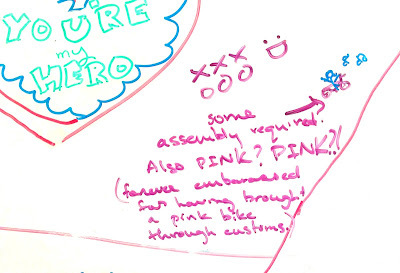 (As genuinely fond as I am of my co-workers at 〇〇 High School, and as much as they already knew I was quirky, I prefer not to be remembered as "that one that asked me to ship a bike to her".) In the end, I asked my friend Nicole, of Irish Chocolate fame. She returned to Japan after leaving 〇〇 University and is now an English teacher in Chiba. She saved me from a separate mishap involving Mister Donut cups (better write about that someday) and so I thought might be able to intervene again. Luckily for me, Nicole agreed, and some time later my bike appeared, fully formed, at her apartment. Nicole, bless her, bought a bike-sized cardboard box online and wheeled it all down to her local shop, where they took it apart and packed it up. Then she brought it back (how!?!?) and called Japan Post for an at-home pickup. Except...it didn't fall within Japan Post's size guidelines. The JP Post guys returned two hours later with the box in tow. It was too big! She reported that it would have to be done via a commercial shipping company like FedEx. Now we were getting way, way too expensive, and I wasn't sure what to do next. I'd already sunk more money into the box and the domestic shipping to Nicole, and the losses were too big for me to cut now. We decided to Frankenstein the box to make it smaller, since that approach worked for Emily when she sent her kotatsu home, but after some measuring, it literally needed to be half the size. Nicole promised to look up some options when she got home from her vacation in Europe. I decided to take a different tactic. My roommate, M, had made plans to go to Japan for a concert in October. I decided to ask her if she'd check the bike as her second piece of luggage (oversized). She agreed without too much protest, to my relief, and so I asked Nicole to have the bike courier to Narita Airport instead. Surprise - the luggage shipping company that we usually use for the airport, doesn't accept bikes. Nicole had to call JAL ABC, because apparently Sagawa thought we were asking them to ship some expensive French racing bike worth $8,000 and not the little steel mama-chari I bought at Daiwa Cycle for under two hundred bucks. Luckily JAL ABC agreed to take it (after warning me about a COD fee) and it was delivered to Narita on the day M was to return to Canada. After all, what was the next step if the bike got stranded at the airport? Call ABC and try to convince them to ship it back to Nicole (I really wanted to stop bugging her) or to another friend? Jes kindly agreed to receive it when I sent a desperate-sounding email asking for her address, but I didn't want to face the phone call where I explained that I, an uninvolved third party, wanted to use a foreign credit card to have this package sent not back to the sender or recipient but to someone else altogether. Also, what was Jes going to do when she got it? It was just too big! Luckily, M hadn't checked in yet, and decided to forge ahead. Air Canada, bless them, accepted the box without complaint, and it was successfully on its way to Canada at last. I waited until 2:30 AM for the inevitable email about something going wrong, before finally dropping off to sleep. In the morning I called for an airport van cab, and then I called the bike shop to arrange assembly, and then I recruited a friend with a car. BIKE BIKE BIKE BIKE BIKE. It wasn't until she arrived in Calgary and they opened the box for inspection that M realized the extent to which I had thrown her under the bus. If you've ever thought about visiting Japan and decided not to solely because of the cost, I have the solution for you - off-season travel. February would normally have never been my first choice for a trip there (I'd probably rank cherry blossom time, Christmas, New Year's, Tanabata, release-of-the-annual-Detective-Conan-movie, early October, and late April above February, especially since the plum blossoms were suffering this year) but hey, when life hands you lemons - or a $745 round-trip, taxes-in ticket to Tokyo - you make lemonade in February. Or whenever Delta Airlines wants me to! Net loss on the ticket for me was actually just $145. (!) Because I flew Delta the Easter before last and got bumped off the last flight of the night between Detroit and Toronto, I was handed a $600 voucher as compensation. Originally I thought "Great, Delta? When am I going to travel with them again?" - it had been my first Delta trip in years. I thought maybe I'd use it to go to Florida and see my adorable godson. (He still has parents, no thanks to Mount Fuji.) But a lucky coincidence saw prices to Tokyo drop below $800 for the first time in ages thanks to Air Canada and Delta competing to beat the other in the Detroit/Toronto market to Narita. One had a sale; the other matched it; the other undercut it; etc. So I thought this was an unbelievably lucky coincidence and ponied up $145 out of pocket to buy my ticket within a day. The last dates available were for February; I needed to kill off my debt and save enough to get me through, and thought I might be fortunate enough to catch the plum blossoms at Ishiyamadera. So February was go! And, I thought, accommodations would surely be cheap in the off-season, if I didn't feel like sleeping in a capsule hotel or a manga kissa every night. You see, I was going alone - and then my cousin got on board by nabbing a similar trip on AC for $800, three days later, from Detroit. Companionship! As February approached, the itinerary from my previous post grew ever more complicated. Hokkaido! Kyushu! Shikoku? There was big deviation from my original "sleep every night in a train and wake up halfway across Japan" plan. But boy, did we ever have an adventure laid out for us. I was really thrilled that the Japanese text said "Okaerinasai" - welcome back. When the big day came, I woke up with crazy jitters, and remembering a botched flight to New York last year, got to the airport super early. Got to Detroit with no issues. (I love that DTW airport's signage is all bilingual Japanese/English!) Hit the first snag there - a flight to Hong Kong was cancelled, so all its passengers got rerouted onto our flight, killing the empty seat between me and the other lady in my row, and keeping us grounded for an extra 2 hours. Luckily, there was no one waiting for me on the other side of the trip. (What a thing to say, but it's true! I wanted my alone time in Japan, as with the exception of a few trips with Emily, I always travelled solo!) I could take my time picking up my rented wi-fi hotspot, browsing the shops, picking up dinner of omurice-onigiri and Kochakaden milk tea, and trading in the voucher for my Japan Rail Pass. 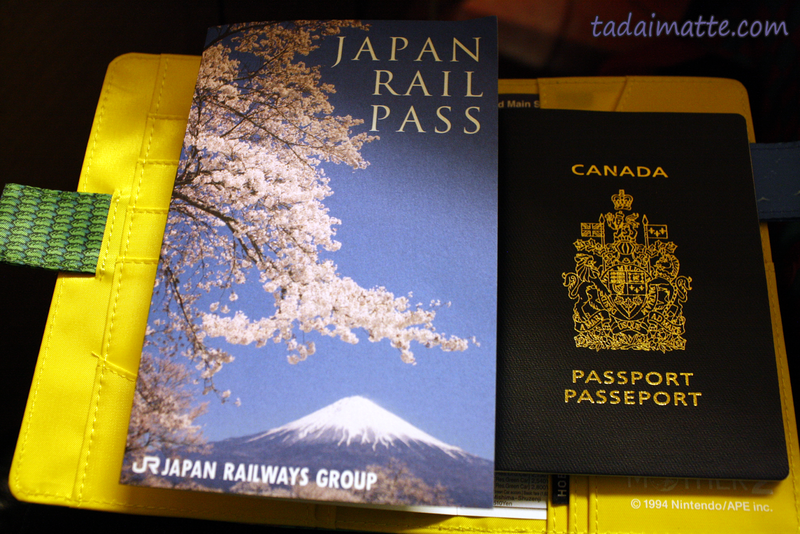 A Hobonichi Techo cover is an awesome passport/railpass holder. 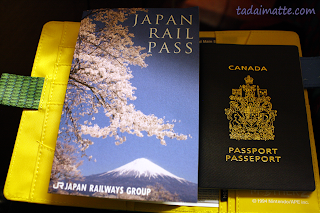 Most travellers to Japan are familiar with the Rail Pass, but since they aren't available to residents, I had never had one before. (Let me assure you, it's far more convenient than the Seishun 18!) I wasn't sure whether it'd be worth it to get the 14-day pass, since I was starting with several days in Kansai, and the Rail Pass is totally useless if you're staying any length of time within Osaka or Kyoto. It's not accepted on any of the local private train lines or subways, and of course, I wanted to be in 〇〇 City for a stretch, staying local. Still, because we did want to go to Kyushu and Hokkaido (I would have flown, for just one) we decided to spring for the two-week pass, paying about $380 USD for it. I paid for the NEX and held onto my pass to activate the next day. I was so excited, finally arriving in Tokyo for the first time in 5 years - it was surreal; like something out of a dream. Riding the NEX, I was so itchy to get off and get moving that I started packing up the moment that I saw that the Chiba landscape had slowly morphed into that of the Tokyo outskirts, and got my bags down (wow - such a tourist!) the second the station announcement came. Never mind that it was at least 5 minutes ride from there! In truth, I remember little about the first night, even though it probably wasn't even 6 PM when I left the airport - which basically sums up most of the travelling I've done in Japan, since there's little sleep and much effort required for the journey itself. I don't even remember what I did with my luggage, just that I felt too much like a tourist in a city I once thought of as my home-away-from-home, so I got rid of it in a coin locker somewhere and came back for it later. I do recall that one of the first places I went was Shibuya, my favourite nighttime strolling spot. I went up Center Gai and visited the LOFT there to buy a Hobonichi Techo for the year. I bought the special EarthBound cover even though it only came with the Japanese version of the book rather than the English one. I went to Starbucks over the scramble crossing, though I didn't buy anything. I think I just wanted to soak it all in. Then I went to Yurakucho to set up for the evening. 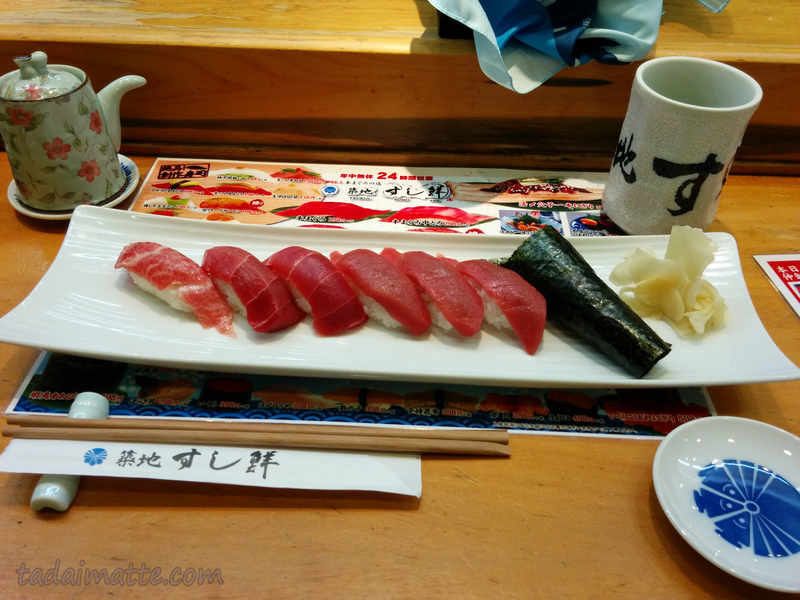 Next year, the famed Tsukiji fish market will be moving to a new location, and it's one of the things I never made time to see - or rather, by the time I planned to see it, there was no time. I recall settling down to sleep in my favourite Shibuya net cafe (how many nights did I sleep there after spending an hour blogging about my travels in Odaiba? Kids, don't try this at home) back in June 2010 with the intention of going to the market the next morning, but it was closed on Mondays. So this year I checked the schedule long before, and I chose a manga kissa a few blocks from Tsukiji, and I don't recommend it because they had almost no flat rooms, had curtains for doors and the lighting was too bright to sleep and oh man, was I ever excited. I probably napped in the uncomfortable chair only two hours before I decided to head out. As it turns out, even 4:15 AM was too late to get access to the tuna auction, so instead I ate an absolutely delectable spread of tuna to make up for it. Otoro, Chutoro, Maguro...the perfect breakfast. After breakfast, I wasn't hanging around waiting for the auction to start anymore, so I did a little shopping in the market itself, chatted with the fishmongers. Too difficult to explain the circumstances when they ask "what do you do?" so I just replied that I was an English teacher from Osaka. Then around 5:30, I went for a little walk around the area and ended up at Hacchobori Station. From there, I returned to Shinagawa, fetched my luggage from wherever I'd left it (Tokyo Station, I think) and set out for Kansai. There was a lot more I wanted to do in Tokyo, but I was eager to get home-home. I got to Kyoto somewhere around 9 AM and headed out on a local train line to meet Mari-sensei, a teacher and friend from 〇〇 High School. She is retired now - and busier than ever - but she was a tremendous help to me when I first came to Japan, and she certainly hasn't changed! She was kind enough to offer me space at her beautiful home during this visit, and since her house was just a block away from my old apartment, it was a great chance to reconnect with the neighbourhood. How I missed it! I guess I am easily impressed, but I was also really looking forward to having a bath in her fancy temperature-controlled bathroom, and I was not disappointed! It was my first full day in the country, but I was booked solid - the whole day was reserved for meeting with students. I was barely at Mari-sensei's for an hour before I set off back to Kyoto to meet Mina-chan, one of the students from 〇〇 High School who made an extraordinary impact on me. She is definitely the student I've heard most from since leaving Japan, and I really appreciate her making that effort. (She even called me on my birthday, my first year home!) Currently she's studying abroad in the U.S., so I was lucky to catch her in Japan before she set out. We had a nice lunch at Ganko Sanjo, strolled around the shotengai for a few hours and visited a matcha cafe that had the most amazing matcha ice cream, matcha pancakes, and of all things, fresh hot matcha latte with marshmallows. In the evening, I returned to 〇〇 City to meet with another set of students, Akari and Saki, who had been in my class as 11th and 12th-graders. They were in the same grade but the opposite class from Mina. I felt like I had gotten to know that group well because they had been in my class for two full years, while in the other class, other teachers had come and gone - the ALT previous to me; the NET who left seven months after I arrived; even the NET who replaced him only stayed a year. I liked to think that I was able to really make a good connection with the students who were in 10th and 11th grade when I arrived, because - especially for the 10th grade - they saw me every year, without fail, and I was right up there crying with the rest of the teachers on their graduation day! That was why I was doubly happy when these students offered to see me during my little trip to Japan. That they could take time to meet with a teacher they hadn't seen in 5 years spoke volumes. I was so touched. ;o; We ended up, of all places, in a little izakaya that I had gone to just once a long, long time ago with Emily, James-from-South-Africa and other JETs from the neighbouring city. It was really nostalgic, and we had a great conversation. I can't believe so many of "my kids" - just about all of them now - are graduating from university, marrying and having babies! When I got back to Mari-sensei's house I was really looking forward to that bath, and then the following day, visiting 〇〇 High School itself. That'll be a story for the next part of the travelogue, however! 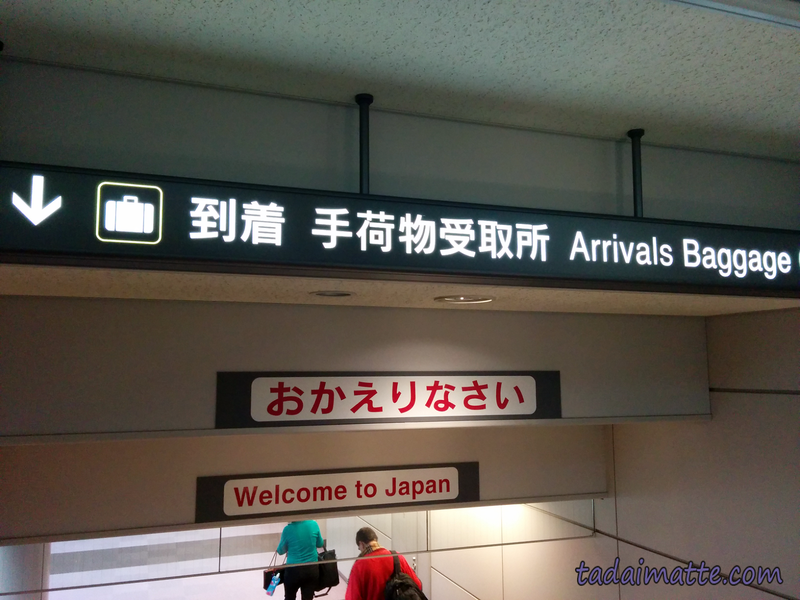 Back In Japan, Five Years On - tadaima-tte! Usually, this would be around the time of year that I start talking about (or complaining about) the annual Japanese Language Proficiency Test. But this year, oh no, you're all off the hook! Since, by some miracle, I actually passed last year's test, I am giving myself a break and saving myself the $70. That's okay, there's plenty more to blog about, if I ever sat down and made the time for it! For example, I have 1500+ photos from my trip in February, and I've posted very few of them here. Every time I think about blogging, I can't quite decide what to write about...but maybe it's time I shared some stories of my trip, so that I'll have a diary of sorts to look back on, like the one I kept when I was actively living in Japan. We tried to cram a lot into this trip. It was my first time back in 5 years, so I had a lot of catching up to do! I bought the ticket on a whim during an absolutely stunning $745-round-trip seat sale (via Delta, of all things), and got literally the last available dates on the sale so that I'd be able to save up. A few days later, my cousin Cassius was overcome with envy and bought a ticket of her own for the same time frame, minus a few days. I love showing people My Japan and also discovering new things about Japan, so we put together an itinerary that was a good mix of both, chock-full of train travel, Pokemon Centers, and the occasional onsen. This is where Cass and I differ. Whereas I could go to Japan and literally just take a bath every single day, that is not her cup of tea. When she visited me in Japan 7 years ago, I morbidly embarrassed her by taking her to the onsen and being so excited that I didn't even notice her level of discomfort. So I tried to play nice this time, and also add in lots of things she likes. And she likes Pokemon, so I decided to take her to a Pokemon Center! I decided to take her to every Pokemon Center in Japan! That deserves a post all to itself, so I will come back to the Pokemon topic later. He knows where you've been. 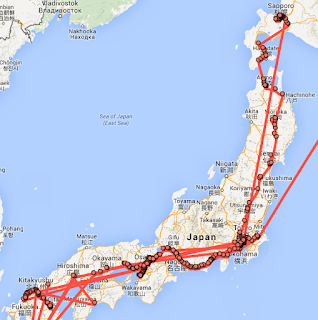 Anyway, in the months leading up to our trip I tried not to over-plan, but I also wanted to hit a lot of places. I had to go back to 〇〇 City; 〇〇 High School. I wanted to ride a bunch of blue trains before they went out of service forever. I wanted to go to Hokkaido, which I'd never been before, and revisit Kyushu to do research for a novel. And if you haven't looked at a map of Japan, those places are literally on opposite ends of the country. Oh my! Well, if you glimpsed the map from Brother Google, you know we did all that and more. 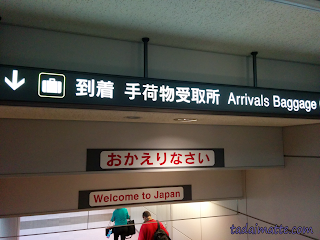 So stay tuned for the first days of our grand cross-Japan adventure! The Japan Foundation Toronto is moving, and though that means a lot of changes and adjustments for those of us who found Bloor and Avenue pretty convenient, the upside is that the library is overhauling, which means clearing out old items, which means VHS TAPE GIVEAWAYS. You might have guessed from my persistent interest in all things retro, that I have just a teensy bit of nostalgia for decades past, with the 80s/90s (my formative years) entrenched firmly at the top. That means I don't just treasure the memories of taping my favourite shows on the family VCR - I still own the family VCR. I actually received a VCR-DVD combo unit for Christmas of 2013! However, 99% of my tape collection is at my parents' house, so I left it there to begin the long project of dubbing dozens of old favourites onto DVD whenever I visit them for the holidays. 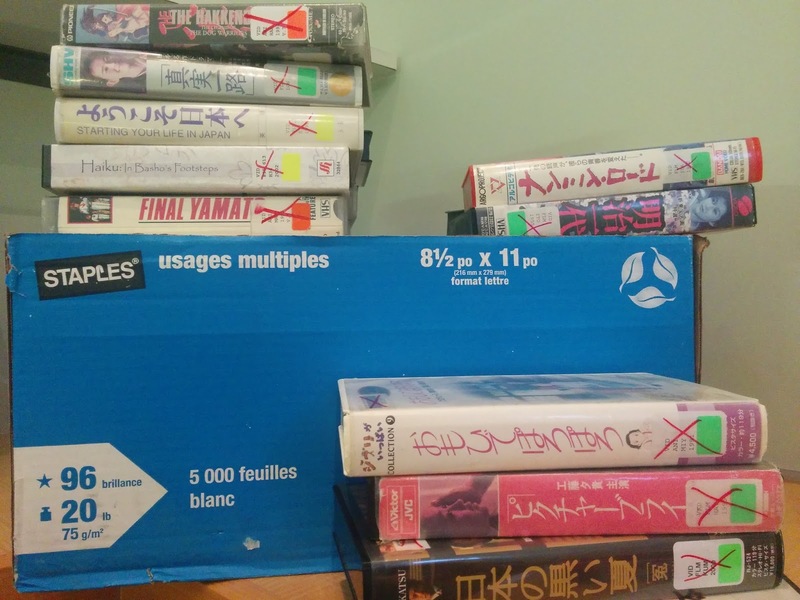 So, when the Japan Foundation Toronto decided to get rid of most of its videotape collection to save space...well, needless to say, the airport x-ray techs probably got a kick out of my suitcase as it went through the scanner on my most recent trip back home. It was so hard to resist! I found some fabulous Tokyo-in-the-late-80s-early-90s snapshots with videos like Neighborhood Tokyo, Tokyo Date, NHK The News 1985 and Norimono Ippai. Lots of glamour shots of the pre-extension Yurikamome Line in that last one. I also scored the Ichikawa classic Tokyo Olympiad, and four out of a set of Japanese recent-history programs covering events like the Hanshin earthquake, the marriage of the crown Prince (now Emperor), and the crash of Japan Airlines Flight 123, which was actually just in the newspaper here, as the 30th anniversary was yesterday. All in all, a pretty impressive bounty of pre-millennial pop culture. I'm sad that these tapes can't be borrowed from the JFT library anymore, but on the other hand, it was good timing for me, because I was able to take the time to watch and enjoy them all, and they won't end up in a landfill, either. I was happy to see how quickly the rest of the tapes (there were at least 500 given away over two days) were picked up by other patrons to take home. Looks like at least a few others out there still have VCRs! I enjoy research - I'm the sort of person who will get caught up for hours on a winding path of Wikipedia articles. I particularly like learning about urban development, and trains. (I probably have a massive article due in the near future about our train journey from Hokkaido to Kyushu taken in February.) So for me, not knowing much beyond the JET Journal perspective on inaka life was not a deterrent, but a challenge! While preparing for NaNo this time, I decided to choose a place I was interested in, and then do the research to make the setting plausible. 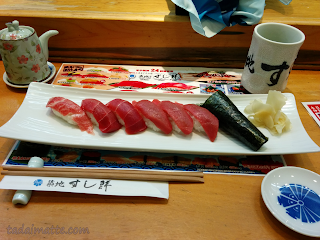 I had of course lived in Osaka and I had written extensively about Tokyo the previous year, so it was time to go further afield, and there was an obvious first choice. I'd recently re-read Ash by Holly Thompson (set partially in Kumamoto), and also discovered the blog nipponDAZE, which chronicles JET life in Oita-ken in the 90s. Kyushu was right up my alley, and I was sure there had to be a town somewhere near Beppu - where Emily and I spent New Year's in 2010 - that a disillusioned exchange student might find her calling in. A few Google searches of JET blogs in Oita turned up a match in the town of Ajimu, recently merged into the greater city of Usa, with a population short of 8,000 people and no train station of its own. At the time, it was not available on Google Street View. (It is now, if you want to have a look.) I made email contact with a JET alumni who had a fabulous website - I'm sure Joel never expected anyone would try to write a novel based only on his blog's descriptions of Ajimu - and started from there. As with any NaNo project, of course, November ended and then I was slammed with the JLPT, prepping for Christmas, nengajo, and the usual writer's burnout that comes when you devote 30,000 words to a topic and then realize you don't know where the story is going. So I never quite finished the tale, though I intend to go back and revisit it for NaNo 2015. Brother Google watches over our travels. With that said, Ajimu was at the forefront of my mind when I planned my two weeks in Japan this past February. In 2011, I often daydreamed about quitting my telephone job and moving to Kyushu to write the great Japan-set YA novel, living at Khaosan Beppu and trading cleaning services for room and board. Or, if I had some savings, in a little one-room apartment with a tatami floor, because I'm still not over that. By 2015, though, I was at a different point in my life, and there wasn't much chance of getting a lot of time for creativity while travelling. I decided to somehow fit Ajimu - even though I had never driven a car in Japan, and our primary destination was Hokkaido - into the trip. My travelling companion had little interest in hot springs, but Kyushu was close to my heart now, and she obliged me, for whatever reason. I applied for an international drivers' license and booked us two nights in a ryokan, following our day in Kyoto. We worked an almost-nonstop pace from Sapporo to Beppu, via blue train and shinkansen, in three days. Alighting in Beppu, Cassie and I spent the night, then rented a car the following morning for my "research trip." (She manned the camera and is responsible for most of the photos below.) We spent four hours wandering and driving in the area without any direction at all, just exploring. At first, I really thought I was imposing, because we could have been at the Hells in Beppu by that point, or - so I imagined Cass would prefer - way back in Nakano Broadway, working the gatchapon machines. Somehow, though, Ajimu became a grand adventure. The tiny, run-down shrine on the cliffs, the bronze turtle statues, the quest to find some restaurant - any restaurant - to eat at - we were soon laughing and snapping photos of everything, getting lost, running away from adults who we thought might be suspicious of gaijin taking pictures of the school, and slowly navigating hairpin curves in the road while the super-confident local drivers leaned on their horns behind us. Oh yeah, and going through the ETC toll lane by accident and bringing all toll operations to a halt while we tried to sort out what was going on. (The rental car had an ETC broadcaster, but no card in it.) We were actually very sad to leave Ajimu without seeing it all, but had another appointment to keep in Beppu that afternoon. It was a gorgeous, sunny day and the highlight of the trip, particularly for Kyushu - the rain would start pouring that evening and chase us all the way back to Kansai. And a good memory. I hope if you've been to Ajimu town, you'll enjoy our photo memories of the day. These apartment buildings look like someplace a JET might live! ...as it turned out, we were RIGHT beside the school! Ajimu's famous for its wine, and turtle soup. Grapes are everywhere! A winery? Or could it be something like the Town Hall? This was a fun-looking spot! Thanks, Ajimu! See you again! Someday I will know my results. 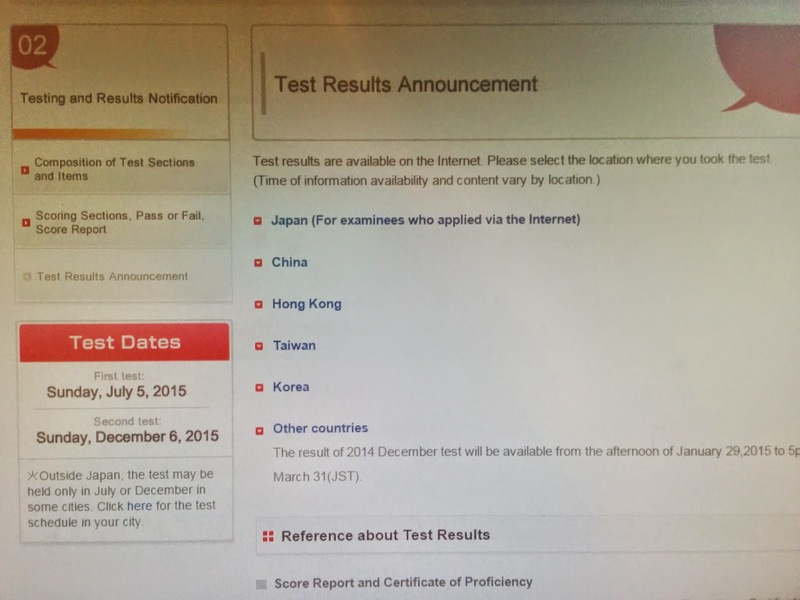 The JLPT in Toronto administered by York University is one of two locations where the test is given in Canada. (The other is in Edmonton, AB.) Now, as a person who lives in The Big Smoke, I have no right to complain about how "far away" York is. (I may have done a little bit of complaining prior to my move here from the Atlantic provinces, though.) I can't even complain about the distance from my house, seeing how I chose to move away from Downsview the year before last. That doesn't mean that on test day, getting to the JLPT is a picnic! So here is my advice for next year's JLPT applicants; common sense, to be sure, but maybe they're more of a reminder to myself for next year...? Aim to arrive midway through the registration period. The lineups taper off a bit towards the middle and end of the registration period. Of course, you don't want to cut it too close, and have the TTC or something else make you too late to write the test, but too early isn't great either, and you'll be lined up awhile before sitting around for an hour just waiting. And getting nervous. Not to mention that aiming to arrive for 8 AM on a day when the subways are not running (meaning leaving my house at 6:30, meaning rising at 6) is asking for you to open up that test book and be so glassy-eyed that you don't know where to start. Don't panic if something goes wrong and you're going to get there right at the end of registration time. You have a few minutes' leeway while the orientation is taking place! Expect to hear from York not too long after you sign up for the test. I say "not too long" because I'm not positive when it is actually supposed to come; for the last two years, I didn't receive my email with my voucher at all, and I waited far too long expecting it to come before I reached out to them. You need the voucher to write the test. Perhaps even more importantly, if you don't receive the voucher, you should still show up. Last year (2013, that is) I thought about the fact that I didn't have a voucher yet about 2 weeks before, and I contacted JLPT support. I was able to get it. This year (2014) I remembered the night before the test, as I ran through the checklist of things I needed to bring the following morning. That's why I was awake at 2 AM Googling phrases like "forgot JLPT voucher" and "JLPT York reprint voucher" and the like. I weighed whether or not it was going to be necessary to rise at 6 and go to York only to be turned away at the door. Luckily, buried somewhere on the site, I read that vouchers could be reprinted at registration. And I wasn't the only one not to receive their email - the line to reprint vouchers was much longer than any other line that morning. In short: You should receive a voucher with your test number. If you don't receive it within a few weeks of registering, ask. Bring something to eat. This test is long and the breaks just barely give you enough time to inhale a small snack. Our group had technical difficulties and started late, which meant that our breaks were cut down. (For the final one, the time of the break's end even was shortened and changed after many of us had left the room.) It took much longer to finish the test than expected, by something like 45 minutes, and I was ravenous enough that after every section I was wolfing down Polish chocolate that I had won the night before as a prize at a Polish wedding reception. Not sure what I would have done without that Jezyki Kokos, Delicje cookies and especially Katarzynki, chocolate-covered soft gingerbreads. I might not be alive right now, without Katarzynki. As for the test itself, I don't actually know how I did on it. That's because you need the voucher to log in online to see your results, and of course, there's no voucher in my email for me to refer back to. I emailed York to get my voucher number, but the password I was provided (generated by them, not by myself) doesn't work in the login page. So did I pass? Hard to say. I guess I'll find out when the paper results are dispatched the month after next...? Maybe next year I will be able to choose between the JLPT and NaNoWriMo as a focus. Fingers crossed for the July version making its way eastward someday!